It is very rare for an original sash window to be beyond repair. They are manufactured from 15 different elements, all of which we can repair or replace using the latest technology. With our many years of experience, at Sliding Sash Solutions, Sash Repairs & Conservation is what we do best! From sill replacements and spliced repairs to repairs using our high-performance Epoxy Repair Compound. For sash repairs & conservation, Sliding Sash Solutions have all the solutions for preserving your original period windows. 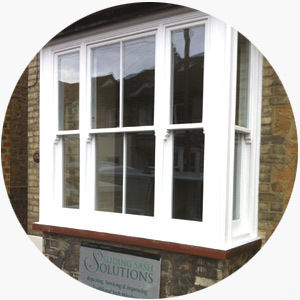 Implementing sash repairs & conservation with Sliding Sash Solutions will keep your windows looking fantastic for years to come. We use Accoya™ timber for all our softwood repair work due to its incredible stability and longevity (65 years minimum), ideal for jointing to original timber. At Sliding Sash Solutions we developed and perfected our own unique design registered products for the improvement and repairs of period windows. Without altering the appearance of your original windows, we can upgrade them to be significantly more efficient than ever before. By installing our unique Solutions Brush Pile System™ you will eliminate the problems associated with traditional sash windows.